Blackened Chicken Breast, Roasted Corn, Yellow Peppers, Black Beans, Pepper Jack Cheese, Avocado, Tortilla Strips, Tossed With Cilantro-Pepita Dressing. Sliced Tri-Tip, Mixed Greens, Red Onion, Cherry Tomatoes, Cucumber, Avocado and Onion Straws. Crisp Romaine Lettuce, Chopped Tomato, Cheddar Jack Cheese, Avocado, Hard-Boiled Egg, House-Smoked Bacon and Choice of Pulled Pork, Brisket or Pulled Smoked Chicken, Tossed With Parmesan Louis Dressing, and Topped With Our Famous Onion Straws. Fresh romaine hearts, parmesan, house-torn croutons, tossed in a zesty Caesar dressing. Crisp iceburg lettuce, cherry tomatoes, sliced red onion, smoked Pork belly, hardboiled egg, bleu cheese crumble. Lettuce, tomato, red onion, 1000 Island dressing, pickle spear. BBQ sauce, caramelized onions, sharp cheddar cheese, house-smoked bacon, pickle spear. Pulled pork or chopped brisket, BBQ sauce, caramelized onions, pepper jack cheese, onion straws, pickle spear. 1/2 pound USDA Prime brisket, seasoned with our house rub and hickory-smoked for 14-16 hours, sliced and topped with our Original BBQ Sauce. 1-3/4 Pound All Natural Fresh Chicken, Pecan Smoked and Basted With Our BBQ Sauce (Will Appear Pink Inside From the Smoking Process). 1/2 Pound Sliced and Served on a Bed of Caramelized Grilled Onions and Peppers. 1/2 Pound of Fresh Bone-in Pork Shoulder, Marinated With Our Dry Rub, Slow-Smoked 14-16 Hours, Hand-Pulled and Tossed in Our Carolina Sauce. Fresh, all natural, horomone free chicken breast marinated, mesquite grilled and basted with our own special BBQ sauce and topped with cheddar-jack cheese, smoked bacon and scallions. 1/2 Pound of fresh, all natural turkey breast topped with our Original BBQ sauce. Thin-Sliced and Served on a French Roll, Topped With BBQ Sauce. Hand-Shredded and Tossed With Our Vinegar-Based BBQ Sauce on a Soft Brioche Bun. Pulled Pork and Chopped Brisket Served With Lettuce, Tomato, Cheddar Jack Cheese & BBQ Sauce. Topped with creamy queso sauce and cole slaw, served on a soft Brioche bun. Half Rack of Baby Back Ribs & one other meat. 14 Oz. Bone-in, Center Cut, USDA Choice, Steak, Heavily Marbled and Topped With Worcestershire Chive Butter and Served With Choice of Any 2 Sides. Breaded in House, Served With Hand Cut Fries, Cole Slaw, House Made Hushpuppies and Served With Jalapeño Tartar Sauce. Velvety, Rich Cheese Sauce, Jumbo Ridged Noodle, Cheddar Crusted Topped and Baked Golden Brown. Choice of Smoked Carnitas, Pulled Smoked Chicken, Brisket or Fish Topped With Shredded Cabbage, Pico De Gallo, Chipotle Crema and Cotija Cheese. Housemade Tortilla Chips, Creamy Queso, Picode Gallo, Guacamole and Chipotle Sour Creamwith Choice of Pulled Pork, Pulled Smoked Chicken or Chopped Beef Brisket. 1 dozen brined jumbo wings with choice of Original BBQ, Honey BBQ or Buffalo. Breaded in House and Served With Ranch Dressing. Guacamole, Cheddar Jack Cheese With Choice of Beef Brisket, Pulled Pork or Pulled Smoked Chicken and Served With Sour Cream. With Dark Chocolate and Toasted Pecans in a Rich Butter Crust Topped With Whipped Cream. All our sides are made from scratch. (Changes Daily) Peach, Apple, Blackberry or Cherry topped with whipped cream. Monday - Friday Until 4 p.m.
Ranch Burger • 1/2 lb. Your Choice of Apple, Peach, Blackberry or Cherry. A Mixture of Brioche Bread and Sweet Custard, Baked Until Golden Brown. Served With Warm Bourbon Sauce. An Assorted Platter of Fresh Baked Chocolate Chip, Peanut Butter, Snickerdoodle, White Chocolate Chip & Macadamia Nut (Unless Otherwise Requested). Triple Chocolate Chunk With Walnuts, Sprinkled With Powdered Sugar. Fresh Mixed Greens Topped With Cherry Tomatoes, Cucumbers, Red Onion, Cheddar Jack Cheese, House Made Croutons. Crisp Romaine Lettuce, Chopped Tomato, Cheddar-Jack Cheese, Avocado, Hard-Boiled Egg, House-Smoked Bacon and Choice of Pulled Pork, Brisket or Pulled Smoked Chicken, Served With Parmesan Louis Dressing, and Topped With Our Famous Onion Straws. (Same as Our Catering Menu) 10 person minimum. Order per person and we bulk it up for you in large aluminum catering pans. Original BBQ, Honey BBQ, Cajun or Buffalo. Cornmeal dusted, fried golden brown and served with house-made tartar sauce. 1 Slab of St. Louis Ribs, 1 Slab of Baby Back Ribs, 2 Lbs. Beef Brisket, 2 Whole BBQ Chickens. 3 Slabs of St. Louis Ribs, 3 Lbs. of Link Sausage, 3 Lbs. Beef Brisket, 3 Whole BBQ Chickens. Choice of Pulled Pork, Chicken , Brisket or Fish topped with shredded cabbage, pico de gallo, chipotle crema, and cojita cheese. Guacamole, cheddar jack cheese with choice of beef brisket, pulled pork, or pulled smoked chicken. Served with sour cream. Requires 48 Hours Advance Notice and 25 Guest Minimum. Coke, Diet Coke, Sprite. Choose two. Only available with Full-Service or Grill on Site catering. 25 person minimum. Just let us know your location, and we’ll deliver your food 30-45 minutes prior to your event in our state of the art thermostatically controlled delivery trucks hot and ready to serve in aluminum and plastic containers. Delivery fees start at $25 and may increase depending upon mileage. 75 person minimum. It’s like having your own, personal pitmaster! In addition to our full service catering we’ll send our professional uniformed pitmasters to grill on site and prepare your selected menu hot and fresh for your guests. Only certain items will be prepared or finished on site 20% service charge applies to all grlll on site events. Prices do not include tax. All events and services are subject to sales tax where applicable. Actual charges may vary, depending on the event. 20% service charge applies to all full service and grill on site events. Gratuity is not included in our service charge, therefore at customer’s discretion. Offers an array of catering options, which can be customized to meet the needs of any event, including weddings, corporate events, private parties and even trail rides. Our options include delivery, full service or on-site grilling. We pride ourselves on quality and service and only serve USDA choice and prime meats along with organic free range chicken, scratch made side dishes and a lot more. All of our bbq is slow smoked in our j&r oyler smokers that are fueled by wood only and produce “real pit bbq” at its best. Call today to speak with our friendly staff to book your next event. Fresh Mixed Greens Topped With Cherry Tomatoes, Cucumbers, Red Onion, Cheddar-Jack Cheese, House-Made Croutons. Sliced Tri-Tip, mixed greens, red onion, cherry tomatoes, avocado & onion straws. 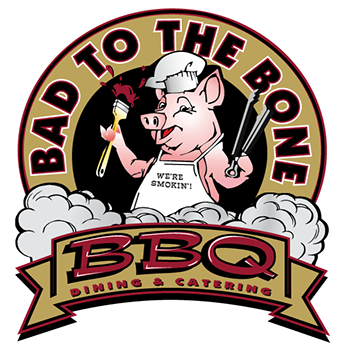 Your Choice of 2 Smoked Meats: Carolina Pulled Pork, Chopped Beef Brisket, Fire Roasted Tri-Tip or Pulled Smoked Chicken Served With Fresh Baked Briosche Buns, Pickle Spears, Bbq Sauce and Choice of 2 Classic Sides. Includes Plates, Cutlery, Wet Naps and Bbq Sauce. Hand-Breaded Chicken Tenders Served With Buffalo, Honey Mustard or Original BBQ.